Sean provided LEGO sculptures and displays for the event, including the gallery's centerpiece. Sean's models of Greenwich Village, The Empire State Building, The Chrysler Building,Mega Lego, and The 1949 Auto Show were on display. Sean was interviewed by ABC (New York), Local New York news (WPIX 11), Famiglia Cristiana (Italy), German TV, British TV, and reporters from Finland and Singapore. Watch sean on local TV news NY1, Read the NY1 news brief. 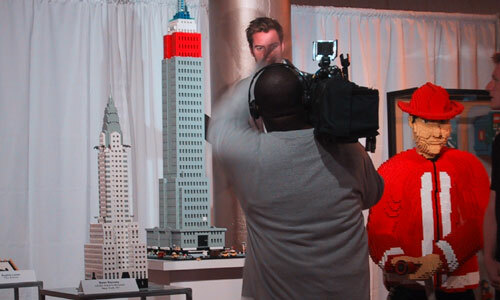 Sean's LEGO New York landmarks set the stage for a TV interview with LEGO Master Builder Peter Grinsell. Sean's Empire State Building was installed as the centerpiece for the International Design Gallery, and was flanked by creations built by over 50 international creative personalities, including Kenneth Cole, Lulu Guinness, Sophia Loren, and Claudia Schiffer. Around the room The main area had several tables set up where press, celebrities, and children could all build. Veteran MasterBuilder Karsten Kristensen (left, second photo) and Guy Bagley (center, second photo) help the intenational press get into the "LEGO spirit". Life-size LEGO children at the entrance, greeted visitors.